Wooden Jewelry Boxes & Chests | Free Shipping on orders over $50! Choose from high quality wooden jewelry chests in an array of fine finishes that are carefully crafted and beautifully styled for ladies jewelry. Each of our beautiful wooden jewelry boxes are designed and created with careful attention to detail, protective linings and ample storage features. Shop more wooden boxes using the quick links below and choose from wood valet boxes for men, wood jewelry boxes for girls or shop wooden boxes by finish. Wooden jewelry boxes and jewelry chests for women provide a lovely way to store jewelry. Questions on selecting a wooden jewelry box? We welcome your call or email. 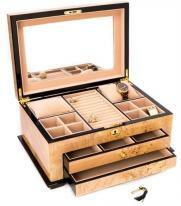 All wooden jewelry boxes qualify for easy 30 day returns and one year product warranty.